It’s done! It is literally the only room in the house that is finished. This tiny powder room makes me feel so happy! Sometimes I go in there just to shut the door, sit on the lid and enjoy the completeness. I bet I’m not the only one who does this, haha. I wish I had more “before” photos. However, the space is so small, there really wasn’t much to look at. There was almond paint from floor to ceiling. Extremely outdated. We literally gutted the entire space. Laminate tile and trim were ripped out. Toilet, sink, towel rack, switch and plug plate covers and the hideous, four bulb, wall light as well. 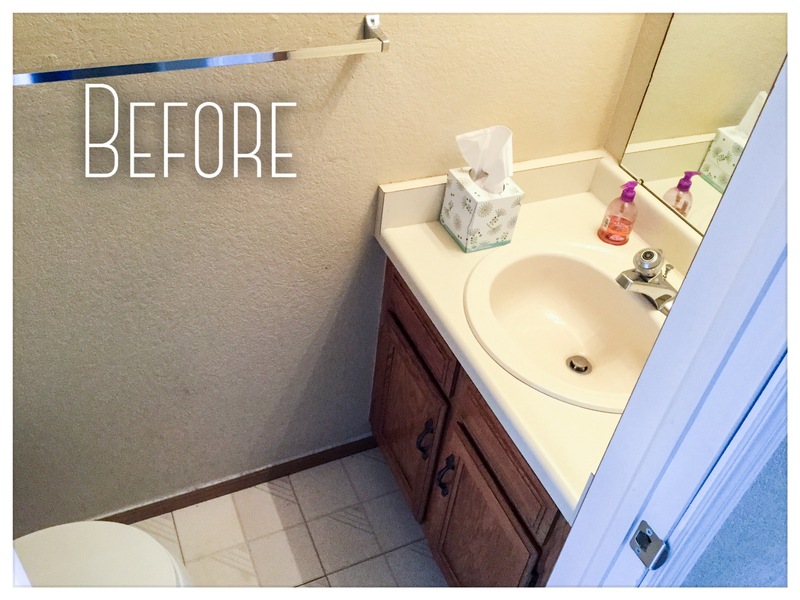 We continued the same Pergo flooring from the main floor into the little bathroom. I painted over the almond ceiling with a fresh white and covered the walls in Sherwin Williams Navy Blue. 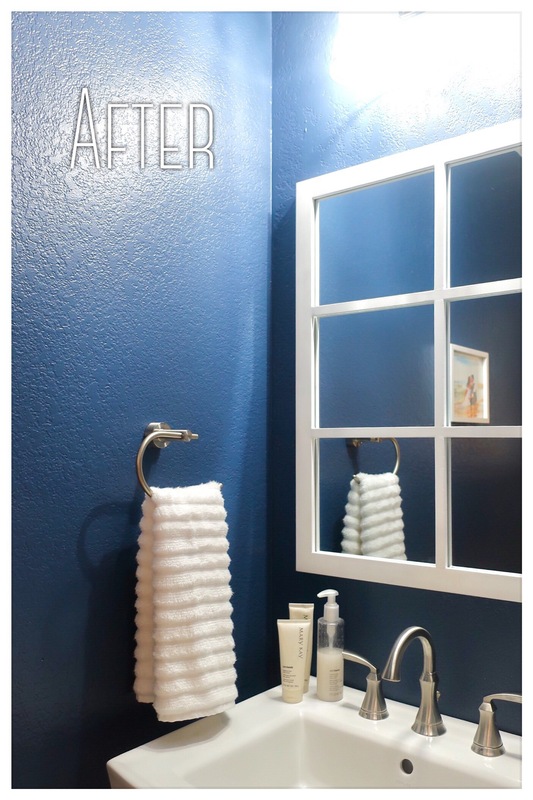 It was a little scary but I was adamant on bold navy for a small powder room. I freaking love it!! My second favorite thing about the room is the window mirror from Hobby Lobby. It replaced the huge, trim-less mirror that was screwed into the wall before. It was so basic I couldn’t stand it. 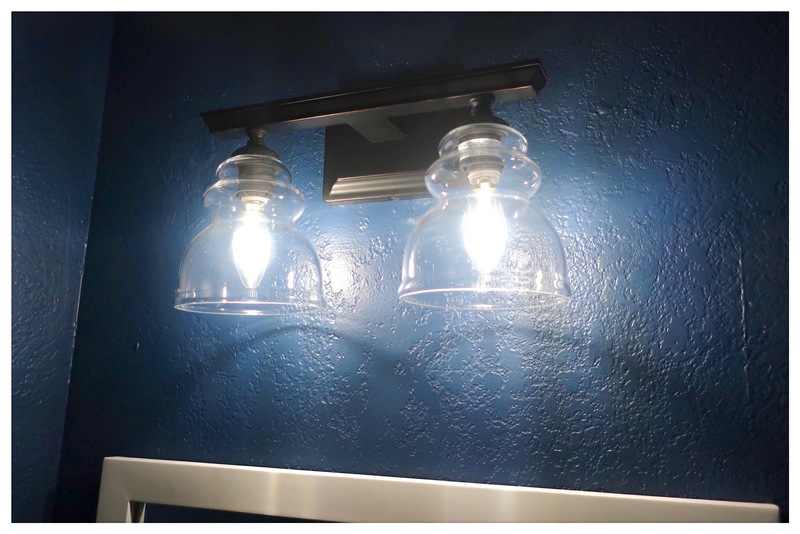 I found the wall sconce online but it was ridiculously over priced at $250. Kent did more research and found the exact same ones on Build.com for about $90. WIN! 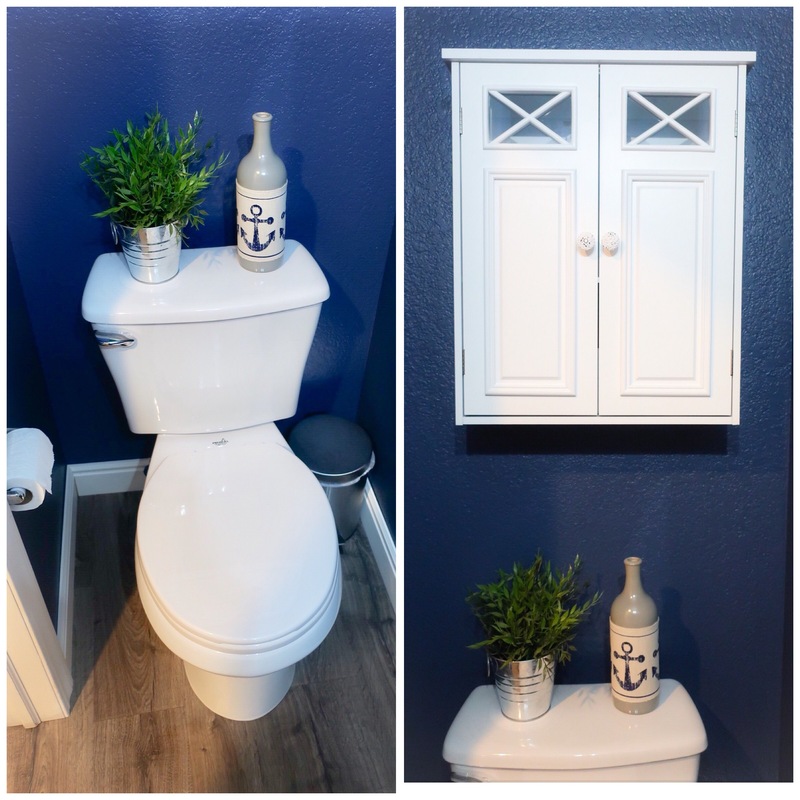 I love the nautical navy and white theme. I could go nuts with it but I don’t want to crowd the space with too many decorations. If I add another item it will have to just scream at me that it was meant for the tiny room. And I highly recommend the Waterlogue app, it’s worth the $4. 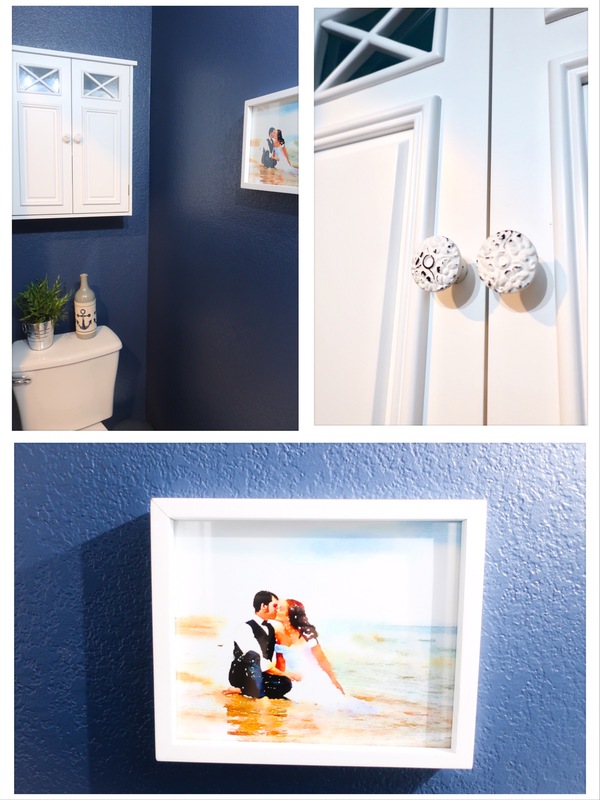 I took one of the pictures from our anniversary photo shoot and made it look like a water-color with a few taps, then had it printed at Walgreens. 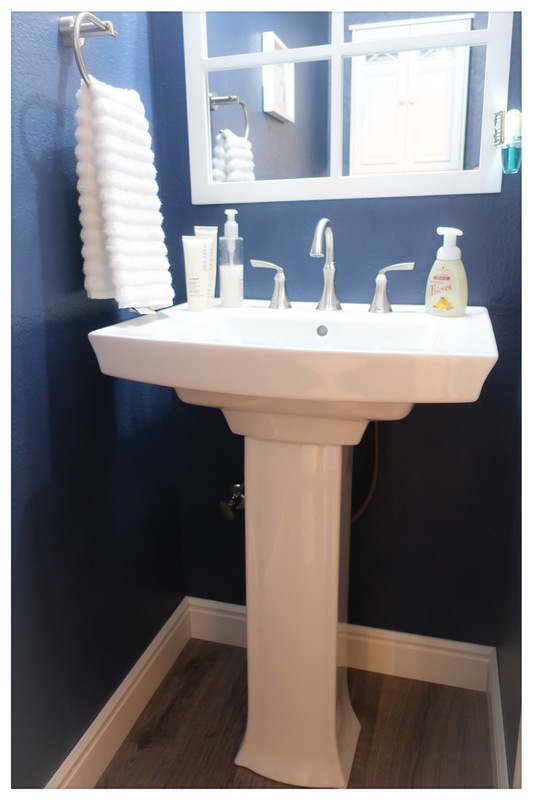 With the pristine pedestal sink increasing the space in the room, I still needed storage. I found the wall cabinet on Amazon for $58. I originally saw it on Wayfair for much more. I personalized it by swapping out the basic faux glass knobs with distressed iron knobs from Hobby Lobby. A simple upgrade for less than $10. I couldn’t be happier with the results of this one!